Russia's notorious anti-gay laws have caused a considerable amount of backlash against Vladimir Putin against Putin — and in a Russian effort to save face, perhaps, the Sochi pre-show opening ceremony was christened by none other than girl-smooching duo t.A.T.u. Although both Lena and Yulia are straight, they've said in the past that their kissing onstage and in music videos has been an act of support for LGBTQ people around the world. And even though though t.A.T.u. opened one of the most politically-charged Olympics to date, they didn't turn down their characteristic hi-octane dancing and singing. They came out holding hands, and remained holding hands throughout the show. But unlike past performances, they never went for their signature kiss — which could well have landed them in Russian prison. 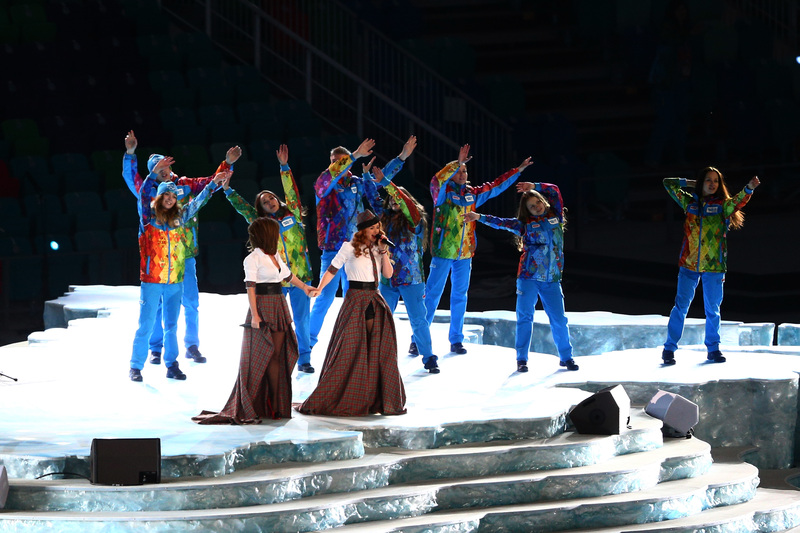 Still, the backup dancers accompanying the two singers were dressed in rainbow tracksuits, which may or may not be illegal under the category of "gay propaganda," which Russia's one-year-old law has banned. t.A.T.u. 's rendition of their 2003 hit, "Not Gonna Get Us," seemed to have been watered-down from the original — but with Putin and the Russian police breathing down their necks, we can't blame them for omitting their pseudo-romance this time.